The American Shut Down has now started effecting the White House also. As the chef did not the salary, so they are now gone on a leave. Due to this, the kitchen of the White House has stopped now and the president now offers fast food to their guests. The president is now serving Pizza and burgers to their guests as the chef are not in chef. The president last month demanded for $ 5.7 Billion or Rs 40,000 crores for the construction of wall along the America-Mexico border. The president’s plea was dismissed by the democrats of the parliament. After that the shutdown was declared. This shutdown is now the longest shutdown in the american history. The shutdown reached it’s 22nd day on Monday. 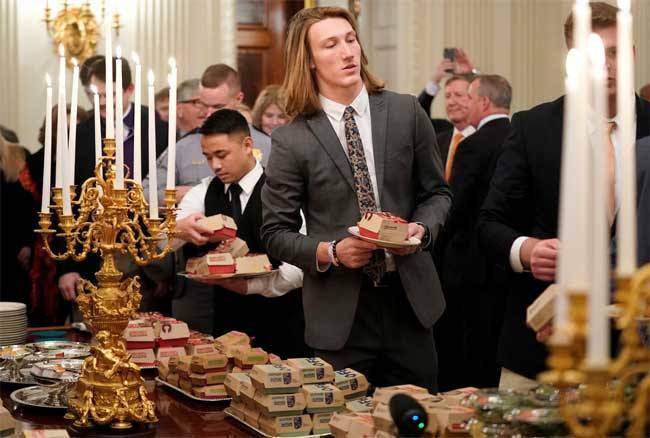 As per the English paper Telegraph, on Monday, Donald Trump invited the Clemens Tigers team the winners of the American College Football Championship in White House on a lunch. But, then kitchen chefs in the parliament refused to work without salary and went on leave on the same day. In this circumstance President Trump organized fast food for guests in the White House dinning area, ordering pizza, burgers and French fries. President Trump also paid for the fast food from his own pocket and didn’t showed any bill to White House. While Donald Trump stood in elections, he said that he will construct a wall along the mexico border to prevent the illegal entry of people from Mexico. And he also took steps on the same but democrats in parliament dismissed the president’s plea. Thousands of people are facing financial problems due to not get paid during the shutdown. As per some statistics, more than 8 lakh worker had not got their pay due to which many went on a leave and many don’t have any option to work without pay. Previous article Is One Plus responsible for I Phones sales drop in India?